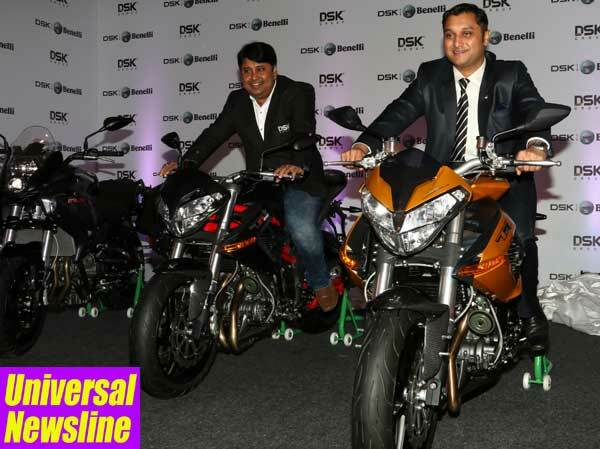 Delhi, June, 2015: DSK Motowheels, one of India’s most well-established and strongest players in the superbike industry, unveiled the range of its legendary Italian superbike brand ‘Benelli’ for the first time in North India, followed by the announcement of its first DSK Benelli showroom launch in New Delhi. The state-of-the-art showroom is situated in one of the most buzzing and central locales of the capital, at Faiz Road, Karol Bagh, near Jhandewalan Metro, showcasing the entire range of DSK Benelli superbikes available in India under the dealership of ‘Torque Bikes’. With a view to strengthen its setup, DSK Benelli also aims at expanding its reach across Northern India, reaching out to a larger audience of superbike enthusiasts in the coming months. The bikes showcased includes the sporty-looking Tornado Naked Tre, or TNT superbikes that encompass the TNT 300 – In-line two cylinder 300cc engine, TNT 600i - In-line four cylinder 600cc engine, TNT 600 GT - In-line four cylinder 600cc engine, TNT 899 - In-line, three cylinder 898cc engine and TNT R - In-line, three cylinder 1131cc engine. Born of rich, pure lineage, DSK Benelli today boasts an impressive range of globally-respected superbikes that marry heritage, innovation, styling and technological prowess. Benelli’s distinctly stylish motorcycles are known for their Italian flamboyance and the ability to provide riders from all walks of life a pure, high-performance experience. DSK Motowheels was Established in 2012, DSK Motowheels, a part of the DSK Group (Diversified business group with a turnover of over Rs. 5000 crores) forayed into the growing automobile sector by entering the niche segment of powerful and aspirational bikes. Taking forward the company’s rich legacy of dynamic entrepreneurship, Mr. Shirish Kulkarni, Chairman, DSK Motowheels, spearheads the brand‘s operations in India with the primary objective of providing a world class super biking experience. As often happens, the history of great industries is born in garages. In our case this is the Benelli Garage”, Where, in 1911, the 6 Benelli brothers Giuseppe, Giovanni, Francesco, Filippo, Domenico and Antonio, known as "Tonino”, repaired and manufactured motorcycle parts. In 1921 the 'Velomotore' was created: a single cylinder two stroke 75cc bike adapted to a bicycle frame and the following year it was the turn of the 98cc 'Motoleggera', immediately appreciated by the public of that time. The first real Benelli motorcycle, a 175cc model, ridden by Tonino, proved immediately to be a winner in the world of competition. Here began a long list of glorious moments, with more than 1000 victories in the Italian and European Championships and two World Titles won in 1950 and 1969. Many legendary riders have ridden Benelli motorcycles. Besides Tonino, the owner of the company, the Italian riders Ambrosini, Grassetti, Campanelli, Provini, Pasohni, Villa and the internationals Saarinen, Hailwood and Carruthers. At the end of the 60's the last motorcycle of the family owned company was born; the Tornado 650 which developed 50 hp at 7000 rpm, and easily surpassed 170 km/h. Later the first ownership change took place, but motorcycle production continued in Pesaro with the ground breaking in line 6 cylinder 750 and 900cc Sei’s which were manufactured up until the early 1980's. In 2001 the production of the first all new in-line triple powered range began, with the fully faired supersport Tornado 899cc Limited Edition. The addition of the Tornado Naked Tre or TNT for short, and subsequently the Tre-K in both 899 and 1131 cc variants meant that Benelli was truly back in the market of large capacity sports motorcycles. Today Benelli is part of the Qianjiang (QJ) Group, a corporation which produces more than 1.2 million two wheelers per annum. QJ, wishing to respect the tradition of passion which has always guided the history of the Italian brand, will continue manufacturing bikes in Pesaro, the traditional home of Benelli Motorcycles.